At least that’s the position I’ve always taken when arguing with speed-figure handicappers and others who believe that a single race can “gut” a horse — à la Rachel Alexandra in the 2010 Woodward. Frankly, I feel the same way about “bouncing” that I do about global warming. I don’t doubt the phenomenon — thoroughbred racehorses clearly have good and bad days (just ask Itsmyluckyday) and statistics show that the Earth’s temperature is, in fact, rising slightly — but I am very dubious of the conclusions that many draw from this data. No, I do not think that man (in the general sense) controls the fate of the planet. To paraphrase a line from my favorite holiday movie “It’s a Wonderful Life”: In the whole vast configuration of things, I'd say man is nothing but a scurvy little spider. Likewise, I think it is generally foolhardy to say, as followers of The Sheets and other speed rating services often do, that a certain pattern of numbers indicates a horse that is “over the top,” or due to run a poor race. And I think it is particularly foolish to assert that there is an optimum number of days between races that allows these “gutted” animals to recover — or not. The fact is, when one is dealing with a finite data series, which, for the most part, speed figures are — horses can only go so fast or so slow — what we see from animals that regress after a particularly impressive performance is more often a return to the mean than it is a reaction to a hard race. Did pitcher Philip Humber of the Chicago White Sox “bounce” when he gave up nine earned runs in five innings on April 26, 2012 — a mere five days after he became just the 21st player in the 135-year history of Major League Baseball to throw a perfect game? Few of sound mind and body would argue that he did. Through May 11, Humber has a 5.34 career earned run average and is 0-8 this year. What happened on April 26, 2012 was simply a return to the norm; in Humber’s case, a return to mediocrity. Now, having said this, I think it is equally obvious that greatness, at least as it relates to sports, can be defined as an athlete (or team) that consistently produces outstanding results. Most people know that Wilt Chamberlain is the only player in NBA history to score 100 points in a game, but how many people know that Chamberlain scored 60 or more 32 times (yes, that’s a three followed by a two)? I can already hear the grumbling: Fine, fine… thanks for the sports history lesson, Poindexter. But what do Humber and Chamberlain have to do with horseracing and bouncing? I doubt many racing fans would disagree with me when I say that winning the Triple Crown is among the toughest achievements in all of sports. After all, only 11 horses have pulled off the coveted Kentucky Derby-Preakness-Belmont Stakes trifecta and it’s been 35 years since the last one (Affirmed in 1978). What all 11 of those horses had in common was consistent brilliance — at least during their Triple Crown run. At no point was this more evident than in 1973, when Secretariat set a track record in each of the Triple Crown contests (I don’t care what Pimlico officials say). Similarly, Sir Barton (1919), the first Triple Crown champion, set a track record in the Belmont Stakes; Citation (1948) destroyed the track record at Garden State in the Jersey Derby, a prep for the Belmont (Citation also raced six times in 61 days prior to his 8-length score in the “Test of Champions”); and Whirlaway (1941) set a track record in the Run for the Roses. The other greats that won the Triple Crown also showed remarkable consistency. This got me to thinking: Could one use this factor to determine whether or not a horse is a viable Triple Crown contender? 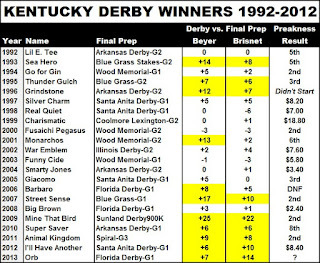 Of course, I had to use the old Daily Racing Form speed ratings for this one, but even utilizing that simple formula (100 minus the fifths of a second the winner’s time was off the track record minus beaten lengths) — and without using track variants — it is clear that even Triple Crown champs tend to record consistent speed figs. In fact, Secretariat, one of the chart “exceptions” actually set a track record in his race prior to the Wood, which was arguably the worst race of his career (explaining his 20-point ascension in Louisville). So where does this leave Orb? Well, honestly, it makes him a bit vulnerable — especially if any of the other Preakness contenders improve. Will Orb, like Secretariat, be the exception to the "greatness rule"? Believers will get even odds or less to find out. My God, do I agree. Both about horses bouncing and anthropogenic global warming. Anyone who believes in AGW needs to have their head prayed over. The idea that mankind can affect the climate on this planet in any significant way is ludicrous. As to horses bouncing, I've always been dubious. On the Thorograph Blog (where I think it originated) these people are so caught up in jargon and looking for patterns that I don't know how they have time to actually evaluate the past performances. I'll say here what I've said many times before. Speed figures are opinion and not fact. If you want to be any good at this game, you have to decide for yourself how fast a horse ran in a given race. Picking horses is not a science. Judgment is key. For instance, the trend to timing races in hundredths is just silliness. It's pretending to a level of exactitude that the game simply doesn't possess. The fact that Beyer and Thorograph numbers are for sale is a tacit admission that Beyer and Brown can't make money betting their own numbers. Nothing could be more obvious. "...the trend to timing races in hundredths is just silliness. It's pretending to a level of exactitude that the game simply doesn't possess." REALLY like that statement. I think that is precisely what numbers tend to do -- instill a false sense of security/knowledge. My favorite example of this is Jeremy Bentham's "Hedonistic Calculus," whereby pros and cons are weighted via numbers... yet those pros and cons are still SUBJECTIVE. Great post -- 10 out of 10 (if you had disagreed with me, I'd have rated it a 1, LOL). Ridiculous post, both in regards to global warming and horseracing. The fact that you are citing the DRF speed figures says it all. Since my point was that global warming is not a man-made phenomenon, I can only assume that you do, in fact, think that humanity is causing the lion's share of it. Coincidentally, you make this observation on the very day that a devastating tornado touched down in Oklahoma, killing dozens. Tell me: How much progress have human beings made PREVENTING such disasters from happening? Because if we can change the Earth's climate, surely we can also stop natural disasters from occurring, right? The point that you and others who believe as you do miss is that an observation is not the same thing as a conclusion. We can OBSERVE a “bounce,” i.e. a regression in form; it is quite another thing to draw CONCLUSIONS from this observation — and it is the conclusions that “Sheet” guys draw from regressions in form that I take exception with. Now, assuming you’re a “Sheets” user, you should have a TREMENDOUS advantage over me. Yet, I predict any edge you possess will be very thin. Now, in regard to the DRF speed ratings, if you have the “Sheets” numbers for Sir Barton in 1919, Gallant Fox in 1930, etc. PLEASE send them to me and I will adjust the chart… yeah, that’s what I thought. I did the best I could with the data I had. 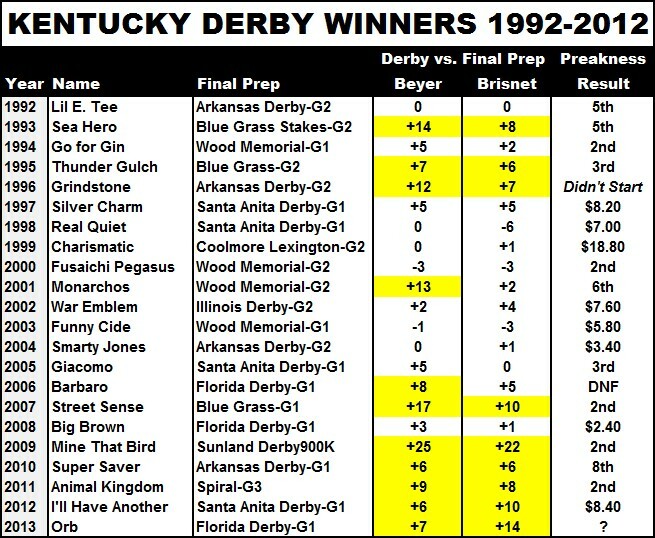 Plus, it may surprise you that a guy named Jim Bayle did a study years ago that showed the DRF speed ratings, with slight modification, were only slightly inferior to some of the other speed-figure services available at the time (I reference that study at http://blog.twinspires.com/2011/09/truth-about-speed.html). Yes, I believe that human action has played a large part in global warming. How is that arrogance? If there were to be a global nuclear war do you think that wouldn't drastically affect the earth's climate? Is that not man made? I don't see that as being much different that decades of pouring toxins into the atmosphere. Your argument that because man can't prevent natural disasters from happening somehow implies that man can't alter the environment for the worse is silly and completely without logic. I lack logic? You jumped from human beings contributing to present-day global warming to a global nuclear war (LOL)! But even if we were in the midst of a global nuclear war, we STILL couldn't destroy the Earth (it's unlikely that we would kill all life on Earth either, although we'd make a good start). Your arrogance is in believing -- even for a second -- that mankind is a powerful force in the universe. We are to the universe what Sonny was to Cher -- totally irrelevant. As for your comparison of toxins in the atmosphere to a global nuclear war... well, that's just beyond silly. You stated that mankind is incapable of impacting the earth's climate. I pointed out that man has created nuclear weapons, which if detonated, would certainly impact the climate. Which part of that is illogical? I did NOT say that mankind is incapable of impacting the Earth's climate. My exact statement was: "I do not think that man (in the general sense) controls the fate of the planet." It is NOT LOGICAL that because we are experiencing global warming, humans are the sole or even the primary cause. Likewise, it is NOT LOGICAL that because a horse regresses in form it is (solely or primarily) due to the animal "bouncing" off of a hard race. There is absolutely no proof of this; and, in fact, there is much contrary evidence.